The three Washington Quarter issues of 1932 were the first of the design which has been used in modified form up to the present day. While one of the issues (struck in Philadelphia) is generally available in all grades the two others (struck in Denver and San Francisco) are considered to be classic key dates and are the most difficult coins to acquire within the series. While the Philadelphia issue is not considered to be a rare coin it can be difficult to find in gem (MS-65) condition or higher due to the large circulation of virtually the entire mintage. The introduction of the Washington Quarter, in 1932, was done to commemorate the 200th anniversary of the birth of the first President of the United States. At first a commemorative medal was to be issued, as authorized by congress, but later it was decided that one of the circulating coinage designs would be replaced. For that purpose all denominations would have been suitable, but the choice was given to the Quarter, replacing the Standing Liberty Quarter which had been introduced in 1916. The design of the new Washington Quarter was chosen through a competition, to which a relatively large number of designs were submitted. The competition was won by John Flanagan. His design featured a bust of Washington, viewed from the side, on the obverse while the reverse had a modern depiction of an American Eagle. This design would be used until 1998, when the obverse was further modernized and the reverse changed altogether with the introduction of the 50 State Quarter series in 1999. John Flanagan’s original design would later be restored with the start of the America the Beautiful Quarters Program in 2010. The year 1932 still saw the impact of the Great Depression, with America recovering from one of the major economic downturns of all time. The mintage levels of the various denominations, including quarters, had dropped significantly from heights seen earlier in the century. This would not change with the introduction of the Washington Quarter, and all three Mints would strike limited quantities in the first year of issue. That said, the Philadelphia issue stands out with a production of 5,404,000 coins. Most of these went into circulation, although enough uncirculated coins have survived to make the issue available in lower uncirculated grades. Both the Denver and San Francisco coins, however, are a completely different story. The combined mintage across the two branch Mints is less than one million pieces, and in fact, both issues represent the only coins in the series with a mintage of less than one million pieces. The Denver Mint had a mintage of 436,800 coins, while the mintage at the San Francisco Mint was even lower, at 408,000 pieces. However, the Denver coins appeared to have circulated more widely, as they are at least twice as rare in uncirculated condition compared to the San Francisco coins. Still, neither coin is easy to find, and in gem grade and higher the issues represent true condition rarities. 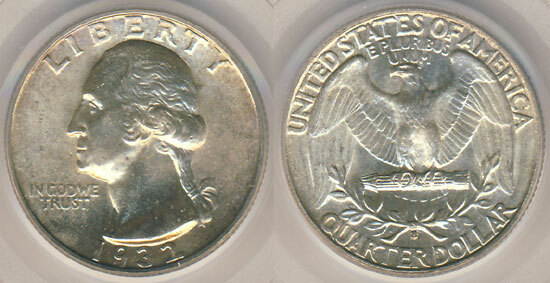 Counterfeits, as with other rare coins, are also a problem with the Branch Mint 1932 Washington Quarters. Since the Philadelphia issue of the same year is generally available, a relatively large number of circulated coins of that Mint have been seen with an added mintmark. In order to discern counterfeits from genuine examples, care should be taken in examining the mintmark and the area around it. Added mintmarks will often have the wrong style or placement, and the area around the mintmark will often show signs of tooling, such as heat induction when the mintmark was “applied” to the coin. Authentication is strongly advised when buying a 1932-D or 1932-S Washington Quarter especially in higher grades. As the 1932 Washington Quarter from the Philadelphia Mint has the highest mintage for the year, this is also the coin which is the easiest to find in all grades, although eye-appeal is sometimes lacking. Gems are scarce, although not to the extent of the 1932-D or 1932-S, and can be found with some searching. The finest 1932 Washington Quarters certified by PCGS are two pieces which have been graded as MS-67. NGC has also graded two coins in MS67 as the finest examples. The record for this issue at public auction stands at $21,850 for one of the pieces graded by PCGS as MS-67. The Philadelphia Mint 1932 Washington Quarter is a coin which remains popular, representing the first year of issue for the series, and is usually in demand across all grades. The 1932-D is much rarer in gem condition, with the single finest known example graded by PCGS as MS-66 and 63 pieces certified in MS-65. The latter population no doubt has been heavily influenced by resubmissions, as they are seldom seen at public auctions and trade very infrequently. NGC has graded eighteen coins at the MS65 grade level, with none finer. The sole MS-66 example holds the record price for this issue at public auction, selling for an amazing $143,750. Circulated coins are much more affordable, often costing just a few hundred dollars, although they remain scarce due to the low mintage of this issue. The 1932-S Washington Quarter is slightly more available in gem compared to the 1932-D, although the difference is rather minimal. PCGS has graded four coins in MS-66 and a total of 101 in MS65, with this number once again likely influenced by resubmissions. NGC has graded five coins at the MS-66 level and 63 pieces in MS65. 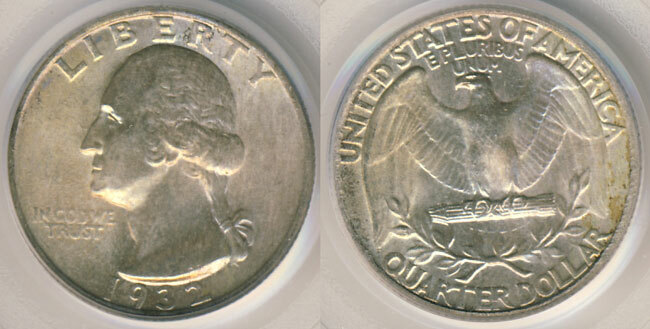 The highest price paid at public auction for a 1932-S quarter stands for a PCGS MS-65 graded example which sold for $ 21,850 in November of 2003. More recently two NGC MS-66 pieces sold for almost $ 11,000 each at public auction, while a PCGS MS-66 sold for $18,400 in August of 2001. These offerings are very infrequent and eye-appeal plays a very important role in determining the value of individual pieces. The 1932-S, like the 1932-D, can be found without much difficulty in circulated condition selling for roughly the same prices.